Inside Rock Guitar traces the lives and licks of the 30 greatest electric rock guitar pioneers of all time. 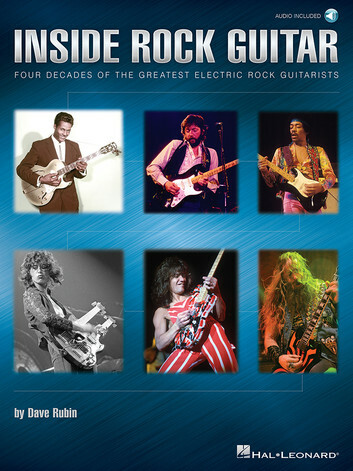 Spanning four decades, this authoritative book and audio package by acclaimed music historian Dave Rubin captures the styles and historic insights of legendary, trail-blazing guitarists who changed the face of rock forever. Inside Rock Guitar provides stylistic music examples in standard notation and tablature, access to audio demonstrations of every music figure, and many rare photos. Guitarists covered include Jeff Beck, Chuck Berry, Ritchie Blackmore, Eric Clapton, Bo Diddley, Kirk Hammett, Jimi Hendrix, Alex Lifeson, Yngwie Malmsteen, Jimmy Page, Joe Satriani, Slash, Pete Townshend, Steve Vai, Eddie Van Halen, Angus Young, and more!